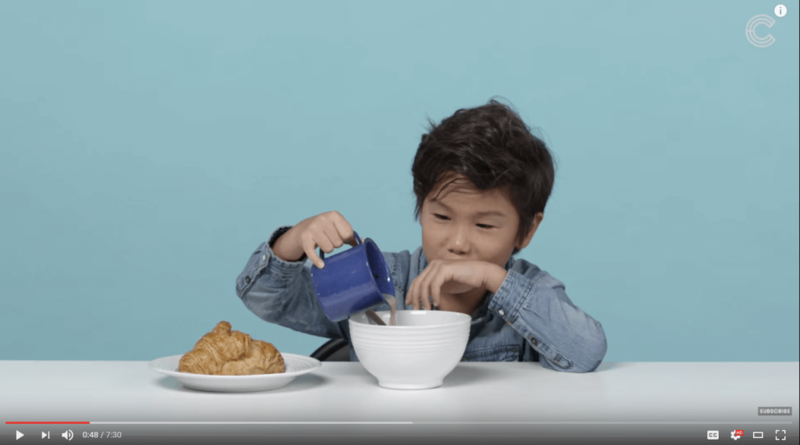 A Seattle-based media firm release an entertaining video on YouTube titled, “French Food | American Kids Try Food from Around the World.” The video is their 5th installment in a long-running series. However, it is a laughable misrepresentation of France and French food. 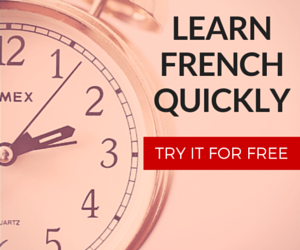 The cliche-filled video riled up a lot of Frenchies in the YouTube comment section. 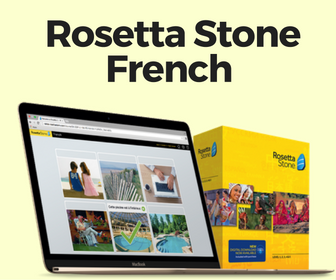 Some called the video a blatant case of “French-bashing.” Others shamed the media company, Cut, for not doing their research and lacking the ability to Google basic French meals. The problems with this video begin almost immediately. The first meal served was “breakfast,” where the kids were given a bowl of cereal with chocolate milk and a mass-produced croissant. A lot of the French commentators harped that they’ve never seen this done. My French cousins do actually pour “Nesquik-milk” into their cereal, however they are the minority. Kids in France typically eat pastries with Nutella or jam, pain au chocolat, fruits, or maybe some yogurt for breakfast. If the kids in the video were served this, of course, they wouldn’t have any funny reactions to film. 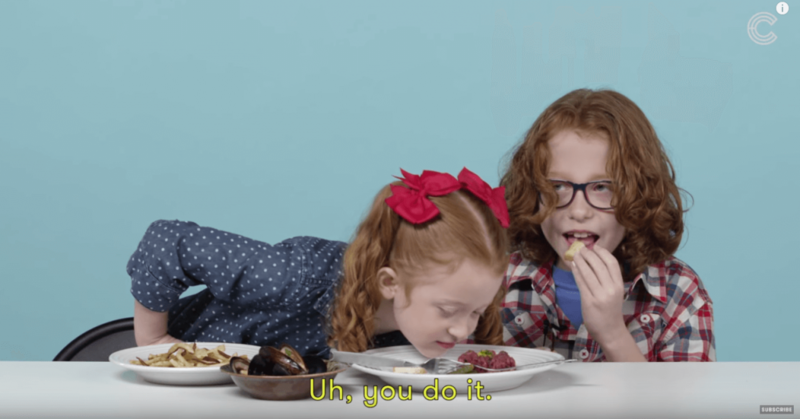 The second faux-pas occurs when the Cut team gives the kids raw beef and a helping of Mussels to eat for “lunch.” However, it’s rare to find French adults who like tartare de boeuf, let alone kids. This is a stretch from reality. 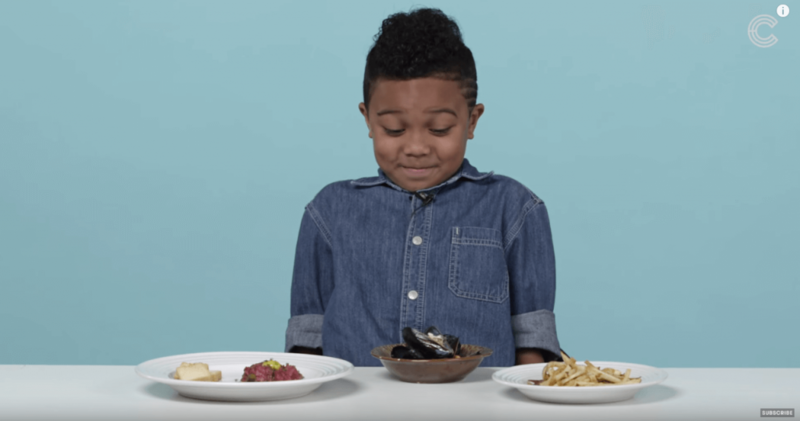 The same goes for when they were given mussels to eat… this is typically not kid-friendly food. For dinner, the Cut team served foie gras and frog legs (les grenouilles). You can start to tell that they’re getting annoyed with all of this “bizarre” food. For dessert, the American kids are presented with an assortment of moldy cheese. While it is true that certain cheeses in France have mold on it, cheese is not “dessert.” Oftentimes we consume cheese after the main course but before the dessert, sometimes cheese is skipped entirely. 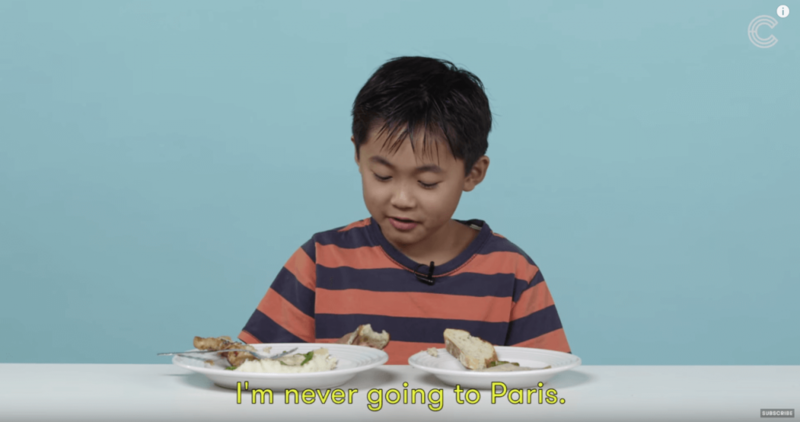 Real dessert in France involves pastries, tarts, fruits and other things that these kids would prefer to eat. 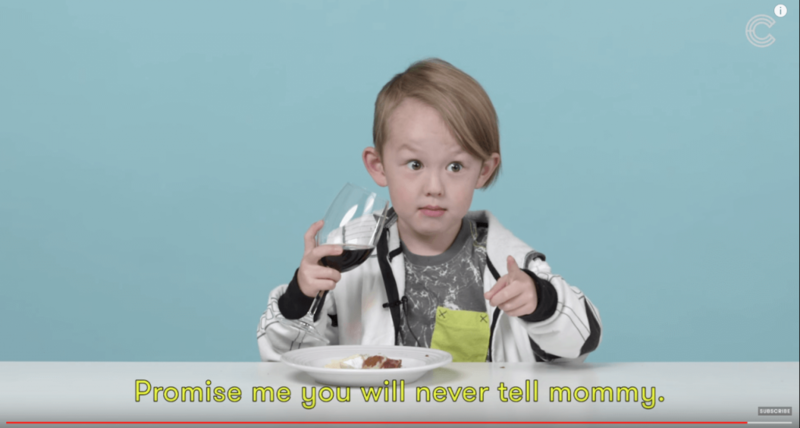 The video ends with the kids being given a glass of “red wine.” Whether the kids were actually given wine or not is not the point. In France, kids at that age are rarely (if ever) are served wine. I found the video to be entertaining. The kids were cute and their performances at time were funny. But this video is far from reality and I felt like that needed to be expressed. While some of this food could be classified as “French” – many of them are specialties which either don’t represent France well or wind up being food that kids don’t eat anyways. …the most important thing I have to says is : CHEESE ISN’T A DESSERT AND KIDS DON’T DRINK wine at all ! not at table! It’s a shame… This is in a way “French food” but you make this video like if it was what we eat everyday in France. Of course, that’s false. We don’t really put our hot chocolate in our cereal, we don’t really eat “Tartare” (raw meat) for lunch. I’m French and i’ve never eat [sic] raw meat, frog, or even cereal with hot chocolate. Please, if you want to make a video like that, can you just make better choice for the food ? Thanks. Do these French viewers deserve to be angry at this misrepresentation of their culture or do you think they’re over-reacting? What were your thoughts on the video and did you enjoy it? I’m not French, but I did a lot of reading and research about French cuisine when I was younger and trying to learn about some of my roots (family’s from Quebec, not French proper, but they did come over from there). I only came across the video today and immediately hit pause when I saw them serving cereal and telling the kids to pour hot chocolate into it. Now I’m glad that I didn’t watch it all the way. It just hurts me to see that someone misrepresented the culture that I have always felt was a part of me in some way. Having viewed a menu from a French primary school the lunch menu was absolutely delicious and very healthy. Many countries could follow their example.